The terrace has a view of the surf break. Great views from the furnished terrace. The whole front of the condo is one big ocean view. Looking from the kitchen to the dining room. The master bedroom has a Cal King size bed. 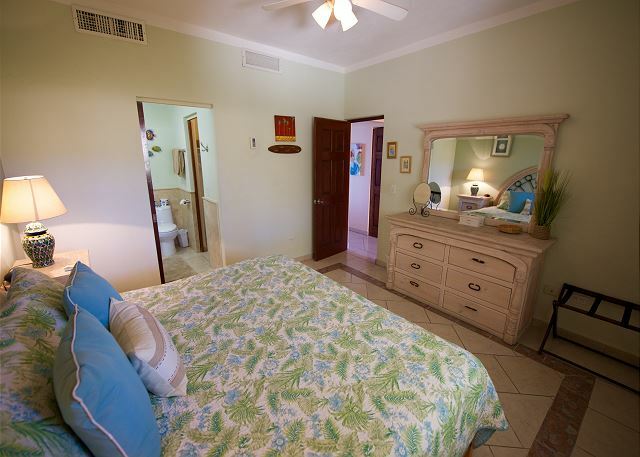 The master bedroom has an attached private bathroom. 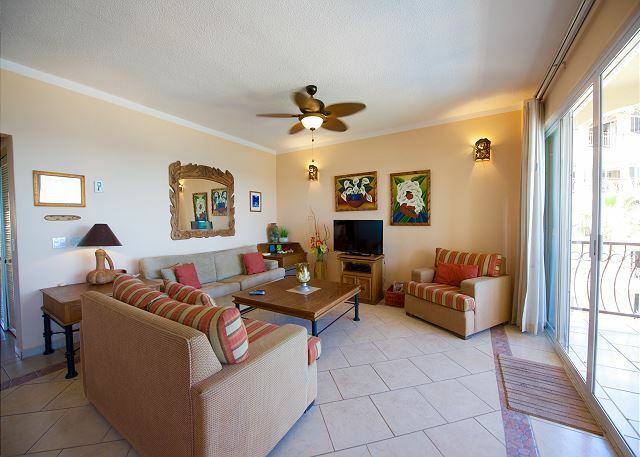 Las Olas sits on the most pristine beach of San Jose del Cabo and has three popular surf spots right in the front yard. 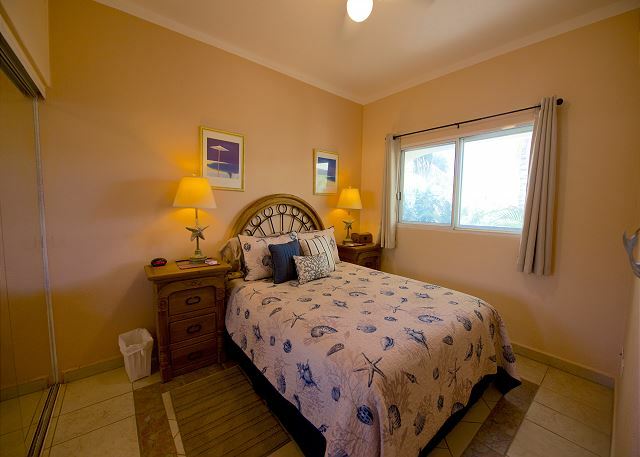 Amenities include secured gated parking, heated swimming pool, 3 tiered Jacuzzis, a work out room, free high speed internet, and a telephone for free long distance calls to the USA and Canada. 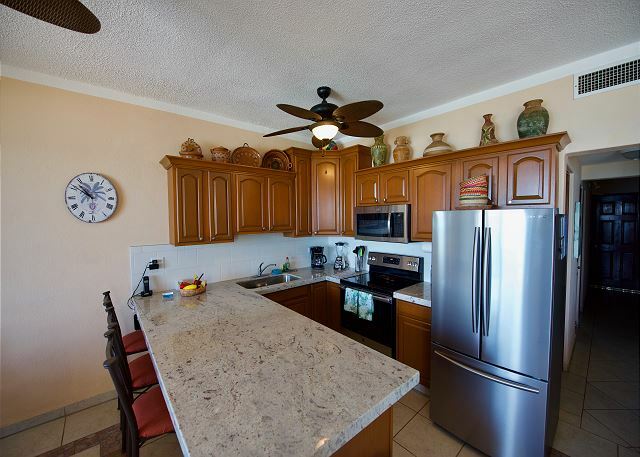 This condo has a fully equipped kitchen with all appliances and utensils, a gas BBQ, patio dining set and seating area, satellite television, and all the comforts of your own home. 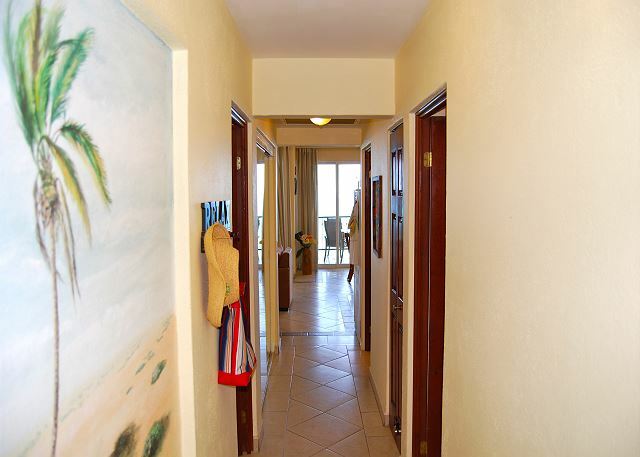 Located in front of three world class surf breaks you can check the surf right from the balcony! There are restaurants, bars, and grocery stores all within walking distance and Cabo San Lucas is only 15 minutes by car. You can make day trips to La Paz, Todos Santos, or go snorkeling at Chileno Beach only a 10 minute drive down one of the most beautiful coastlines you have ever seen. 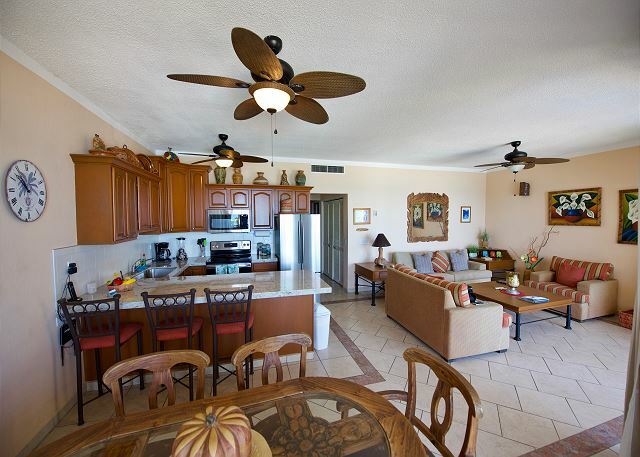 When it comes to vacation rentals, this condo is hard to beat. 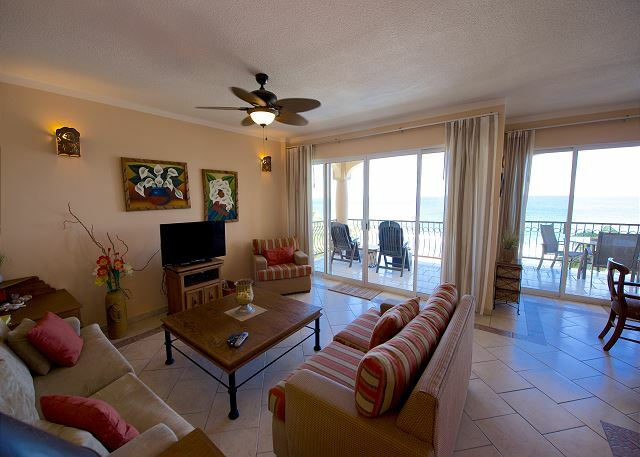 Las Olas 402 B is a lovely condo on the4th floor overlooking the beach. It has all he amenities, was clean and comfortable. It is a VERY hard place to drive to if you don't know exactly where to turn off resulting in a couple of passes through the Retorno. The only other issue is thatb thebedrooms are on the sideof the condotoward the highway and don't have a view of the beach. The highway is very noisy- helped by the sound machine provided in the condo. Other than this, it was a nice place to stay while attending all the events of a wedding. The condo has everything one would need for a stay at the beach. Also, the person who was supposed to be at the gate to let us in and out was not always there and we hadto go find him several times in order to get into the gate. This place is wonderful. The view is great and the sounds of waves all day are a bliss. We had a great time in B402. It was clean and spacious. Miles of beaches and ocean. The unit was just as advertised. Instructions, directions and general information were emailed promptly. Everything was just as they said it would be. No issues with highway sound. Had a great time, totally relaxed! 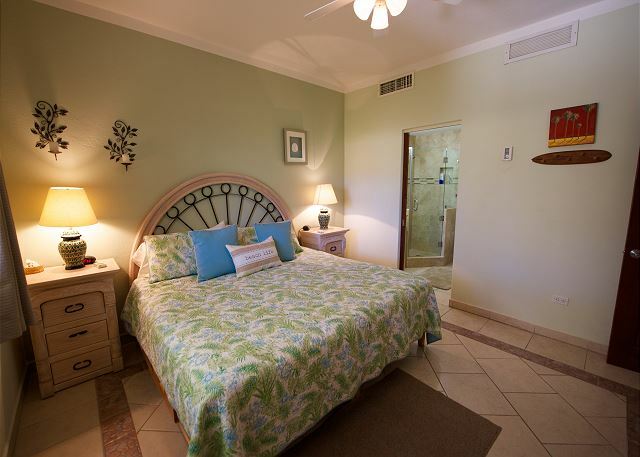 Was our 5th stay at Los Olas condominiums for a surf and relax trip. The location is unbeatable for surfers, three key spots right out front, you literally don't have to go anywhere unless you want to explore. This trip, 78-82 degrees, 76 degree water, consistent head high waves with well overhead sets, was a great trip! The unit had everything you need to be comfortable.